This year at IBC, attendees will see why NUGEN Audio has become the go-to company for loudness management and compliance. We will also be demonstrating how NUGEN Audio is broadening its toolset to address other audio requirements, such as dynamics, upmix, and support for the DPP standard. We’ve taken the lead on addressing dynamic content adaptations with our new DynApt algorithm to expand content repurposing. We’re also proud of our participation in the DPP, which demonstrates our ongoing commitment to supporting the very latest developments in loudness compliance and management. Finally, for the first time, we’ll be showcasing some of our upcoming innovations in upmix technology. 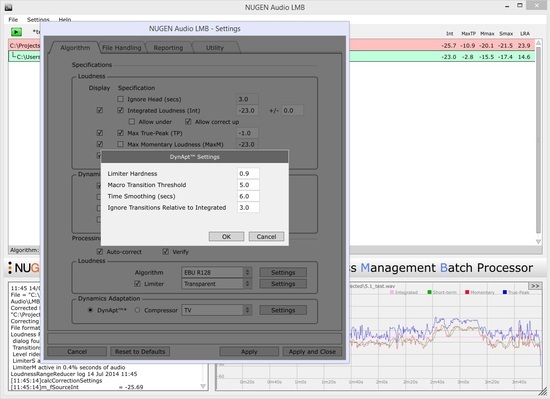 NUGEN Audio’s LMB is an offline file-based loudness analysis and correction program for high throughput applications. A new update to LMB’s MXF file-handling option introduces DPP AS-11 compatibility. NUGEN Audio is a participant in the DPP compliance program, an initiative founded by U.K. public service broadcasters to help speed the transition to fully digital production and distribution for television. As a member of the AS-11 DPP compliance and certification program, NUGEN Audio is helping to develop quality assurance criteria for the AS-11 DPP specification for digital file formats. Making its IBC debut, the MXF file-handling option introduces native MXF audio-handling that enables LMB to perform automated analysis and correction of audio within an MXF container while preserving all other data within the file. We recommend that all broadcasters look at the excellent work the Digital Production Partnership has undertaken to take the various standards and produce a real world set of delivery specifications for all the UK broadcasters. It will make our lives in UK based post production so much easier to be able to provide the same output for all broadcasters, so please broadcasters in other territories take a look at what the DDP has done in the UK and adopt it and make everyone’s lives even easier. Adapting dynamic content such as theatrical releases for TV or TV content for mobile streaming is a challenging task, particularly in relation to dialog. At IBC2014, NUGEN Audio will present DynApt™, a solution for intelligent repurposing of audio for TV and streaming at faster-than-real-time speeds. The DynApt algorithm has been designed to adapt the dynamic content of audio appropriately for different listening environments and playout systems, while respecting the level of dialog in the original mix and meeting specific loudness criteria. The first implementation of this new technology is now available as a DynApt extension for NUGEN Audio’s LMB offline loudness correction program. With film soundtracks becoming more and more compressed and louder we do hope that Nugen Audio will include an expand option into this product as colleagues undertaking repurposing work taking films and preparing them for the small screen are finding that they have less and less dynamic range to the extent that they can increase the dynamic range for the small screen rather than reduce it. At IBC2014, NUGEN Audio will preview a new upmix process specifically designed for film and TV production. Capable of producing a downmix compatible upmix with optional dialog isolation in the center channel, the new technology is projected to be available in early Q2 2015. More and more content is being produced in multi-channel formats like 5.1 and above so having a really good upmixing tool set is really important. We are looking forward to what Nugen Audio have to offer as their other tools like the Vis0LM loudness meter and ISL InterSample Peak Limiter are becoming industry standard tools. 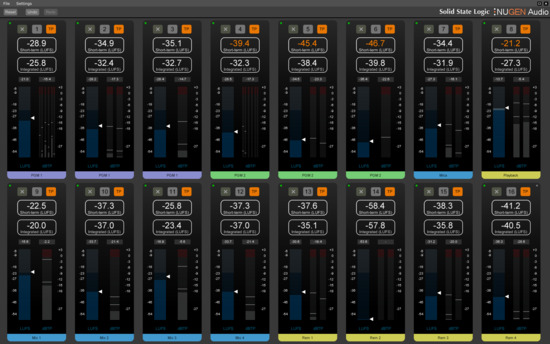 NUGEN Audio will showcase version 1.1 of MultiMonitor, their loudness and true-peak monitoring software application. MultiMonitor offers up to 16 individual loudness and true-peak meters in mono, stereo, and 5.1 formats for up to 96 individual audio channels. With the new version, MultiMonitor now includes network meter reset options and a “tall” meter configuration. MultiMonitor is now available as standalone software or as part of a turnkey solution available through SSL in the LMS-16 hardware system. We would like to congratulate everyone at Nugen Audio for 10 years of excellent innovation and development. Their loudness tools are becoming the industry standard tool set with all the tools meeting the needs of the post production work. We look forward to the next ten years.